Because of their unusual shapes and attractive wood, cypress knees are often made into ornate and useful objects. 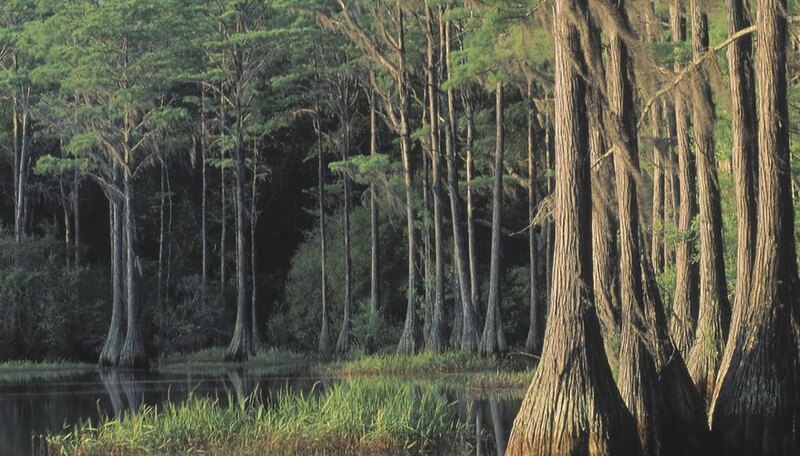 The cypress “knees” are above-water roots of the cypress tree -- thought to help the tree get necessary oxygen during flood times or act as buttresses. Cutting them from living trees was once believed to kill the trees, but recent research suggests they are not vital for tree survival. Since nature made them, each knee has its own peculiar shape, so every lamp will be a unique piece of art. Examine the cypress knee for the best spot to place the lamp bulb, and mark that point with a pencil. Place the knee on a table and measure from the marked point to the surface to find the length of drill bit you need to bore a hole for the lamp rod and cord. Select a spade bit slightly longer than the measurement of Step 2 and of the diameter specified in your lamp kit. Clamp the knee securely in a bench vise. Wrap it with cloth if you need to protect parts of the knee from the vise's teeth. Use a drill to bore a hole straight down through the cypress knee and out at the bottom. Bore another hole the size and depth of the washer and nut included with your lamp kit at the spot where the bore hole emerges from the base, using a countersinking drill bit of appropriate size. Use a router or saw to cut a narrow groove in the bottom of the cypress knee from the hole to the back side of the lamp to house the cord flush against the base and prevent wobbling. Insert the lamp rod, ensuring that it sticks out at least one-half inch from the top surface of the knee -- or as specified in the kit -- then attach a washer and nut in the countersunk hole on the bottom of the rod to hold it in place. Thread the electrical cord through the rod from the bottom and out at the top. Attach the lock nut and neck to the top of the rod – leaving 3 or 4 inches of cord sticking out through the neck -- then slide on the base of the harp. Slide the socket cap over the cord and screw it tightly into place on the neck. Use a utility knife to separate the cord into two pieces 2 inches from the end and strip about half an inch of insulation from each wire without cutting through the wire itself. Tie a knot in the cord just below the point where the cord divides to prevent it pulling back out through the lamp rod. Pull from the end of the cord to tighten the cord against the socket cap. Consult the wiring instructions in your lamp kit to fasten the wires with a screwdriver correctly to the positive and negative screws in the lamp socket interior, and snug it against the socket cap before sliding the socket shell over the top. Insert the harp top in the harp base. Place a shade over the stud at the top of the harp and screw on the finial from the kit to hold it in place. Screw in a light bulb, tuck the cord into the groove on the base, and plug in your new cypress knee lamp. Tall knees may require a drill press for boring straight holes accurately. If the knee base is too narrow or top-heavy, attach a wooden base to the bottom with screws from underneath as a final step before plugging the lamp in.